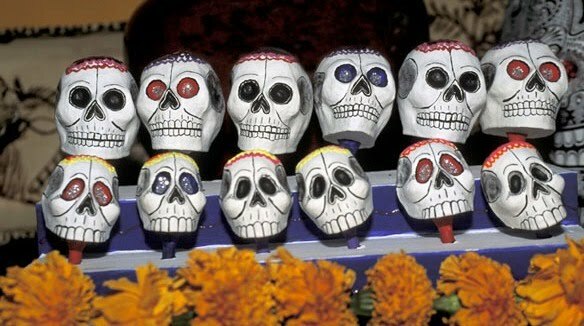 In Mexico, Día de los Muertos (the Day of the Dead), November 2, links ancient indigenous practices and imagery to the Catholic feast of All Souls. In Roman Catholic doctrine, souls which are not condemned to hell but who still need some purgation as a result of earthly sins, spend time in Purgatory or “limbo.” So on the day of the dead, those departed who are still “in play” are invited back into the world. 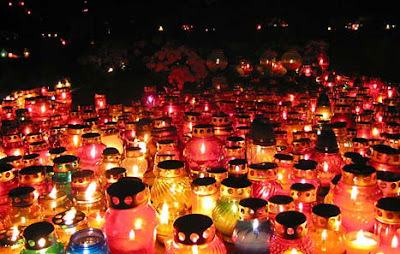 Altars are built to honor the deceased using sugar skulls, marigolds, and favorite foods and beverages of the departed. 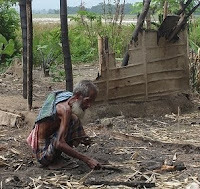 Their graves are visited and these items brought as gifts. All Saints Day, November 1, is the Christian remembrance of those ancestors in faith who have gone before us and passed from this earth. Officially, the festival commemorates those who have attained heaven. In practice, and especially under the influence of the protestant Reformation which has moved away from intermediaries between humans and heaven, people remember all the baptized, “all the saints.” And still more broadly, people remember all those who have died for whom heaven is a hope. Hope is something which connects many death rituals. The great unknown of death is a space into which people naturally project their imagination. The fear of ghosts and other spirits inhabiting the world after life is one side of that coin. And another is the hope that somehow, in the face of this great change, life will continue and that things will be well. 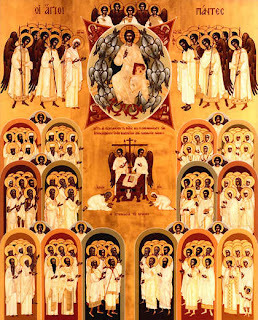 In this icon, Christ is enthroned in heaven, surrounded by angels and saints and the heavenly altar. In the scene below, we see Abraham in Paradise, holding someone (a child?, the poor man Lazarus?) 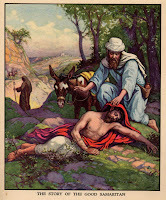 at his bosom, as at the right the repentant thief (Luke 23:32-43) enters. The great testimony of Christian faith is that God has a heart for salvation. All Saints is a hopeful festival. We do not understand the mysteries of the universe, or the mystery of faith, or what the resurrection will be like, but we do know something about hope. We hope that what we see is not all there is - that more and better awaits us. We hope that God’s promises of justice and liberation and peace are still being worked in our lives and in this world. We hope that death is not the end, but that a new life awaits us. We hope that the ones we love and who have loved us are not gone, but waiting for us and praying for us and hoping for us. We put our hope in Christ and his promises that the day will come where all things find their end in a new beginning, a new Jerusalem, a new kingdom where all is eternally whole. This year, as every year, I am a step closer to my own death and I’m remembering more people than last All Saints Day, especially Jon and John and Gregorio and Joe and Frank, saints. Throughout the world, an All Saints tradition is to light candles to remember those lights in heaven who still illumine our way. May God bless and keep all of us still awaiting the fullness of resurrection, and strengthen in us the memory of those faithful ones who inspire us still.